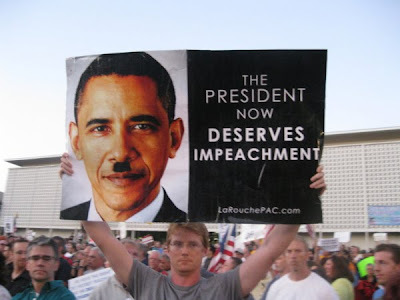 At the town hall health care meetings this summer far left LaRouche activists showed up with Obama-Hitler signs. This same extremist group held Obama-Hitler signs at several events. But, now the AP and Obama are making it sound like these protesters were conservatives. At the G-20 economic summit that wrapped up Friday in Pennsylvania, Obama told a story about an unnamed foreign leader who privately told the president he didn’t understand the at-times contentious debate over changing the health care system. “He says, ‘We don’t understand it. You’re trying to make sure everybody has health care and they’re putting a Hitler mustache on you. That doesn’t make sense to me,”‘ Obama said, quoting the world leader he declined to identify. The reference to Nazi leader Adolf Hitler was to signs some people have waved outside of often testy town hall meetings around the country this summer where lawmakers discussed Obama’s health care plan. In the speech, Obama described his plan as one that would not require people with coverage to change anything but would make health insurance affordable for the millions of people who don’t have any. Republicans dispute those claims. Of course, it never bothered the AP or democrats when Bush was compared to Hitler. 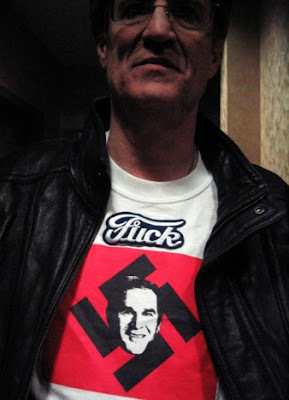 They even mass produced Bush-Hitler shirts. But, it didn’t make any headlines for some reason.